This post contains affiliate links. 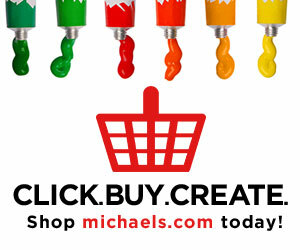 If you purchase something using a link I may make a small commission at no extra cost to you. I'm so excited to share that The Hayden Hanging Basket pattern is now available on the Darn Good Yarn website!! If you haven't heard of Darn Good Yarn, they are an amazing company that sells handmade yarns made by women in India and Napal. All of their yarns are handmade from recycled materials and their mission is to support women who need help supporting their families. To find out more about them you can visit their website here. I was thrilled when Darn Good Yarn asked me if I would be able to create an original pattern for them using one of their amazing yarns! It was so hard to pick between all of the unique fibers they offer. I ultimately went with their Block Printed Handmade Silk Sari Ribbon Yarn in Polka. I just couldn't resist the beautiful polka dot print! I knew it would be perfect for creating a hanging basket. It took some trial and error when designing this basket. First I made a few swatches using different sized hooks, until I found the perfect size for creating with a fabric yarn. I also wanted to make sure that the stitch I used didn't take away from the beauty of the polka dot fabric. Eventually I got it right and it was smooth sailing from there. The best part about working with yarn made from strips of fabric is that when you come to the end of a skein you can sew on the next one and keep going. That means you only have TWO ends to weave in when you are done! Pretty awesome, right? I had so much fun making this basket and I hope that you love it too. Mine is currently storing all of my scrap yarns. If you want to make your own Hayden Hanging Basket you can find the free pattern here. 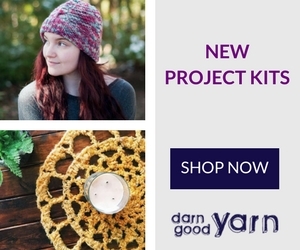 Darn Good Yarn is also offering it as a kit which you can find here. As a special thank you Darn Good Yarn has generously given me a discount code to share with you! Just use meghanmakesdo15 at checkout to receive 15% off your order on any of their beautiful yarns. If you make a Hayden Hanging Basket I would love to see it! Tag me @meghanmakesdo or use #meghanmakesdo on social media so I can see.